St George was one of the most venerated of the early martyrs. According to tradition he was a native of Cappadocia in Asia Minor, of good birth, who became an officer of the Imperial Army. The same tradition identifies him with the unnamed "person of great distinction", mentioned in the Ecclesiastical History of Eusebius, written in the early 4th century, who in the year 303 at Nicomedia tore down the Emperor Diocletian's Edict against Christians. For this he was severely tortured and, refusing to renounce his Christian beliefs, was put to death by burning. His relics were conveyed to Lydda in Palestine, where his mother owned property. A church was subsequently erected over his tomb. Within the next century, many churches were dedicate in honour of St George in Asia Minor and the Middle East. A Council of Pope Gelasius in 494, while condemning the legends contained in the compilation called "The Acts of St George", asserted that he was a real martyr and worthy of all reverence. The eastern Church regarded him as the "Great Martyr". Veneration of St George was widespread in France in the 6th century, and his story was well-known in England from the 7th century onwards, being translated into Anglo-Saxon. Several pre-Conquest churches were dedicated in his honour. His special fame in England developed out of the First Crusade (1096-99). 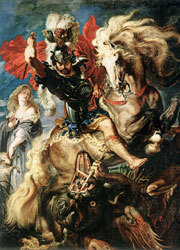 A vision of St George and St Demetrius spurred on the Norman troops to victory at the battle of Antioch in 1098. Thenceforth St George was adopted as their patron. His popularity grew in England until in 1222 St George's Day was appointed a lesser holiday by the Synod of Oxford. His adoption as Patron Saint of England probably dates from the reign of Edward III, who, about 1347 founded the Order of the Garter under his patronage. His day, April 23rd, was declared a feast of the highest rank by Archbishop Chichele in 1415 and ordered to be observed like Christmas Day. Many legends sprang up about St George, the most popular being the story of the killing of the dragon and rescue of the king's daughter. This was first credited to him in the 12th century, and became well known in the late 13th century through the "Golden Legend", compiled by Jacob of Voragine, Archbishop of Genoa. It was a late medieval myth, illustrating the triumph of good over evil. At the Reformation the existence of St George was called into question by Calvin, but it was Edward Reynolds, a puritan divine, in the early 17th century who first confused him with the heretical Bishop of Alexandria, another George of Cappadocia, who died in 361. The historian Edward Gibbon fell into the same error in the late 18th century, and echoes of his mistaken notions are still to be heard today. In 1969 the Roman Catholic Church relegated St George to the mere status of a local saint, no longer included in the Universal Calendar. This view is not shared by the Orthodox Churches. Nor is it in Hanover Square.